"Most of the usual suspects July 2014"
Image reproduced from the Ordnance Survey Get-a-map service. Welcome to the website of the Rhyl & District MRC, I hope you enjoy your visit. Below you will find some brief details of the club's origins and our progress over the years. Further pages cover membership details, our premises and running nights and a rundown of some of the club and member's layouts. Do not hesitate to contact us if you are interested in membership - we are a friendly bunch! The Rhyl & District MRC was founded in 1976. Early meetings were held in member's houses but soon premises became available. At first we shared with other local community groups but as they gained premises of their own, the opportunity arose to purchase what became our present clubhouse. We completed the purchase in 1992 and since then we have developed and expanded the two storey building. Years of tender loving care and prudent budgeting have paid off and we can now boast extensive accommodation suitable for a wide range of railway modelling pursuits. 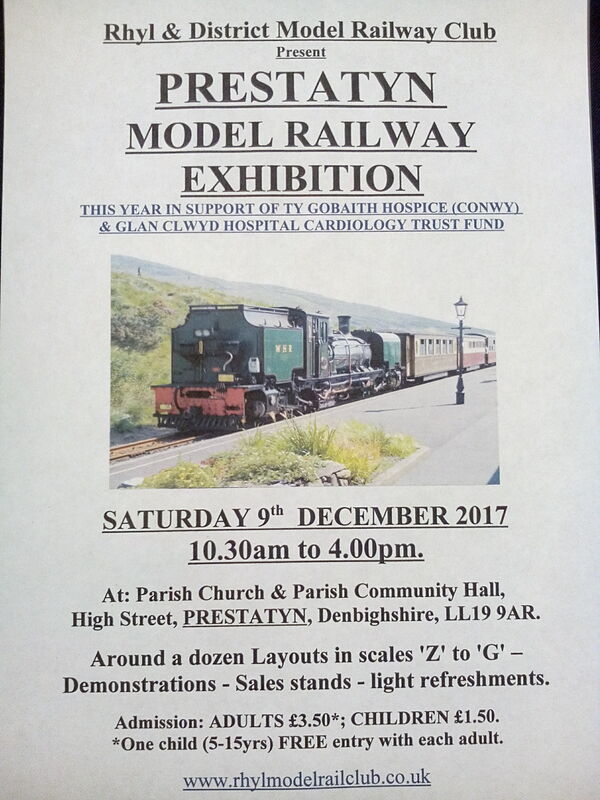 Most of our membership is drawn from the immediate Rhyl and Prestatyn areas but we also welcome potential modelers from the Flint, Holywell and Denbigh localities and further afield. On the ground floor is our social area, the all important tea urn plus kitchen and toilet facilities and ample seating for our growing membership. The other part of the ground floor is a large room offering an unimpeded area of 37' by 17'. Upstairs the modelling area measures 27' by 30'. There is also an extensive library, workshop area and television room on this floor. Our libary has an excellent stock of over one thousand books together with an extensive collection of magazines and videos for members to consult or borrow.